Like Dorothy, Jason sees the man behind the curtain. Except in his case, the wizard is not a trickster but the normal workings of the brain that, in the rest of us, take place outside of consciousness. His injury rendered him both synesthetic and a savant. There are just 30 recorded cases of acquired savant syndrome and not many instances of synesthesia induced by head trauma. Jason is the first person to acquire both in one blow. His access to what is normally off stage leaves him with a “joy in numbers.” He marvels at “how much order runs through” the world. Spiral swirls of coffee cream come alive. Phantom fractals, colored triangles, and pinwheels float before him. He sees the world’s scaffolding laid bare: beautiful geometric patterns, a pixelated, cross–sensory surrounding that in fact exists beneath the surface in each of us. He recites prime numbers in his sleep. Like the Nobel physicist Richard Feynman, also synesthetic, Jason’s equations are colored, have physical shape, and they move: “A huge, prismatic net right before my eyes.” He draws the synesthetic grids and fractals he sees, and wins Best International Newcomer at Art Basel, Miami. The brain is analog rather than digital. Its architecture is regular and highly ordered. Self–contained integrated circuits of 10,000 cells arrange themselves in tidy columns that constitute the basic computing “chip” of the cortex. These microscopic columns replicate a million times, yet everywhere they orient themselves at 90 degrees to the brain’s surface. The topographical maps of vision, hearing, and touch all have a strict point–to–point correspondence with sense receptors in the retina, the cochlea, the skin. Both synesthetes and savants become aware of these orderly calculations behind the curtain, which they experience as color, shape, movement, and geometric patterns. In the 1920s Heinrich Klüver discovered the geometrical underpinning of hallucinations in four basic configurations of tunnels/cones, spirals, starbursts, and grids/honeycombs that he called Form Constants. Jason illustrates them. Jason gets invited on TV shows where his transformation is discussed in hyperbole. Serious conferences in the US, in Stockholm, and Helsinki invite him to speak. He meets top experts and endures the latest technology. 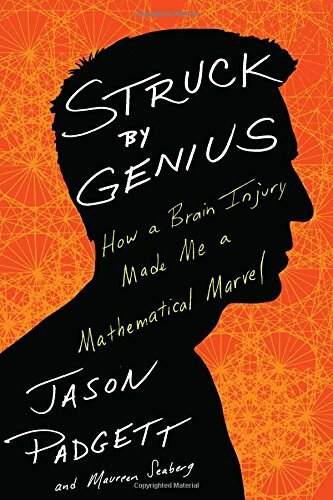 Like other synesthetes (but not congenital savants), Jason’s new talent is a left–brain phenomenon. The book suffers from excess chronicling where analysis is wanted. And then there is this credulous showstopper: “I continued to mine that font of all knowledge, the Internet.” The Internet per se is highly unreliable, its opinions dubious until one vets their source. Otherwise, 10 sites give 10 conflicting opinions. Jason’s obsession with it is a manifestation of the compulsive disorder he developed along with his other changes. Through herculean efforts Maureen Seaberg tears him away, gets him to the right experts, and returns him to the world. In the end, a party boy whose former life was “a mile wide and an inch deep” tells how a fateful accident left him a math prodigy, a husband and father, and a celebrated draughtsman. It is a journey of self-teaching—about what had happened to his brain, why he became a different person overnight, and what the meaning of it all was.